It can be (and has been) argued that Australian netball is at an all-time high. Participation rates are increasing dramatically, more men than ever are playing the sport thanks to the rise of mixed social netball, and the Australian national team, the Diamonds, is achieving as much success as ever. Unfortunately, netball doesn’t get the same amount of media coverage as sports like AFL or cricket get, which means that its best players simply aren’t as well known. We have done some digging, and put together a list of what we believe is Australia’s best netball players of 2017. This list is by no means exhaustive, and we aren’t claiming to have got it perfect. Sharni Layton is one of Australia’s most versatile and experienced netballers. Playing primarily in defence, Layton fills the Goal Keeper, Goal Defence, or Wing Defence position, depending on the game. She has been playing netball at the top level with the Diamonds since 2011, and has gained 22 test caps. She has come into some rare form in 2017, leading to some people naming her the best defender of the era. She signed with the Collingwood Magpies earlier in the year, and has built her form in the national league. Layton played in a number of test matches against England, NZ, and South Africa recently, seemingly cementing her spot in the squad for the 2018 Commonwealth Games. She also captained the Diamonds for a short time earlier in 2017, and is undoubtedly a key part of the success of Australian netball heading into the future. At just 176cm tall and 24 years of age, Gabi Simpson is another one of Australian netball’s young guns. She boasts huge talent, athleticism, and a never say die attitude which has made her a team favourite over the past few years. She recently won the Liz Ellis Diamonds award for the most outstanding performance by any Australian player across international and domestic competitions. She was also named in the Super Netball Team of the Year – a prestigious all-star team made up of the country’s best players across the domestic competition. 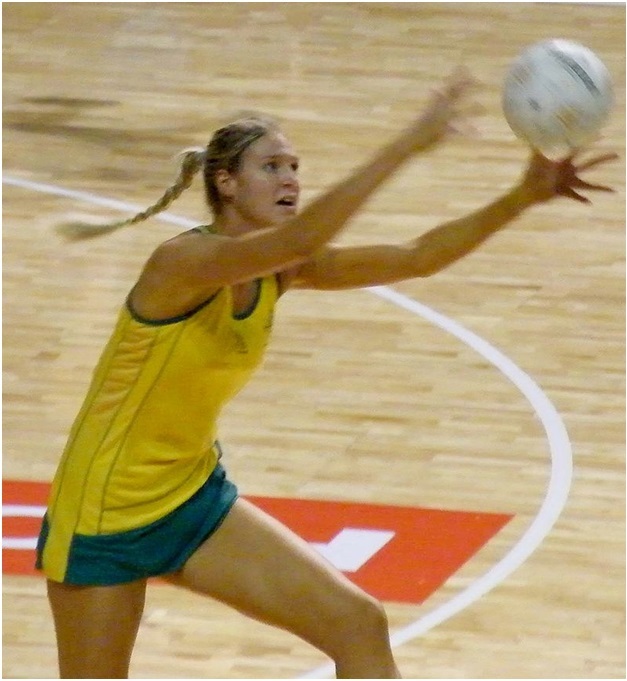 She was the highest ranked wing defender across the last domestic season, and captained the Queensland Firebirds. She recorded an incredible 43 deflections, 21 intercepts, 33 pick-ups, and 34 gains – numbers which highlight her success as a star player of both the Firebirds and the Diamonds team. Australia’s most reliable goal shooter and newest captain, Caitlin Bassett, has continued her run of unbelievable form into 2017. Bassett has developed to become one of the most reliable goal shooters in the world. In a recent match against England, she shot 43 out of 46 goals with an incredible conversion rate of over 93%. If every team had a forward like this, then Australia suddenly wouldn’t stand out as a world netball powerhouse. Bassett has done more than just shoot goals this season – she has shot goals regularly, consistently, and in huge numbers. She was named Australia’s 24th netball captain earlier in the year, an achievement which she would undoubtedly be proud of. She is also the most experienced player on the current Diamond’s list, and she says that she aims to continue her world dominance for at least a few more years. Another one of Australia’s most popular and most experienced players is center Madison Robinson. She is one of the Diamond’s vice captains, and plays a huge role in making sure that the team works together. As a center player, Robinson has a huge say in the success of the team, often racking up huge numbers on her way to regular MVP performances. Although she might not have the superstar name that some of the other players on this list have developed over the years, Robinson is undoubtedly worthy of her place. She has been the heart and soul of the Diamonds success over the years, and continues to give her everything for the team. Barring any major upsets, we should see her leading the Diamonds out onto the court in the upcoming Commonwealth Games, and should hopefully see her claim her second Games medal. Courtney Bruce is a name that many casual netball fans won’t be familiar with. This is because she only played her first game for the Diamonds at the end of August. Although some will argue that she shouldn’t be on this list, we believe that she deserves her spot based on sheer potential. In her first game in green and gold Bruce, a 189cm, 23 year old defender from Perth, had an incredible stats line which saw here named MVP for the game against England. She collected five intercepts, eight deflections, and four rebounds. Some would argue that a couple more performances like this would see the rookie take a place in the squad for the 2018 Commonwealth Games. At the very least, Bruce has definitely guaranteed her spot in the Diamonds team for a few more games. Time will tell whether she becomes the superstar that we saw glimpses of in her first test, or whether she will be a one-hit wonder. For Australian netball’s sake, we hope that she continues to build on her form in the lead up to the Games next year!